There is no such thing as a diet for life, an ideal diet or a universal diet. Invariably, however, there is a common need for food containing a full spectrum of nutrients. When we think of food, our initial thoughts center on carbohydrates, protein and fats. Because it has become virtually impossible to receive the right amount of nutrients through our daily diet, supplementation is the logical choice. Balanced nutrition provides the foundation for successful weight management and the building blocks for a healthy, energetic body. 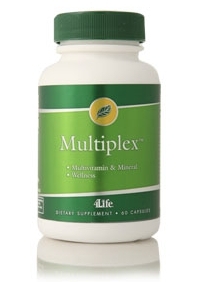 MultiPlex provides nutrients to support general health and wellness and also offers essential vitamins and minerals to support a healthy nervous system. MultiPlex provides a balanced set of key ingredients to support basic nutrition. A healthy energetic body requires good nutrition; this complete vitamin and mineral formula supports maximum health in your body.